Scott has been doing repairs in the sugar woods and gearing up for sap. Typically we start tapping the last weekend of February, but with this strangely mild winter, we are thinking sooner than later! Maybe mid February? Scott's watching the long-range forecasts like a hawk! In the meantime, Quita is busy hiring staff for the busy March and April season...and taking bookings for weekdays. We have so many great staff return year after year that it becomes a bit of a reunion! Family update...for those long-time customers who ask: our "sugar baby" Samara will be 7 on April 5! She is VERY excited about the approaching season. She's now entered the ecole acadienne de Truro after having been homeschooled. And she LOVES it. Too bad Eriel and Kalina can't be here for the season...but I know that they would if they could. Eriel will help Scott again at Saltscapes Expo..and we'll just have to mail the first run syrup to Kalina in Edmonton!! Scott started tapping today! This is a bit early. When we moved here in 1994, Bob taught us to start tapping March 1. As the years have passed, we've found ourselves getting geared up to tap in the last week of February. This year, with such an open and mild winter, we wonder what the season will bring. Today's conditions meant great snowshoeing...but lots of snow-laden branches dropped snow on head and gear all day. Not ideal...but could be worse. Tomorrow Jordan Post will join him in the woods to help. He's experienced and hard working. The push is on, because we see warmer weather coming later in the week. Here is a photo of snow conditions on Saturday. We have almost a full tank of frozen sap and it looks like we'll be dealng with it tomorrow. Just a priming boil at first...and then we'll see what the trees give us. It looks like pretty good conditions coming up - warm temperatures during the day and cooler nights. Up here in the Cobequids we are always a bit colder. We'll see if we get what we need! Scott and Jordan tapped for a few hours yesterday. It was cold, wet and a bit slow going but great to get started in earnest! Today the sun is shining and it's supposed to be a high of plus one. Perfect. We have 2500 taps to get done. Normally it takes Scott about 45 hours himself. Scott didn't tap yesterday...we had steady snow most of the day. Lots to do at the camp to get ready anyway. Today he's trying to get up to the woods as early as he can to get done as much as he can! Scott didn't tap on Wednesday. Too snowy. Yesterday he made great progress: 8.5 hours of tapping and it looks like he's better than half way. Today Jordan will be up on his own - first time. Working on the "white main line" - the newest and last section! Scott finished tapping yesterday, Sunday! What a relief. It was a long day but productive. Now he'll be prepping the sugar camp and evaporator and steam stack. And we wait for sap. The sap's running!! We collected about 1/2 tank last evening and through the night. It's not running hard...but it's running. We'll see if we get enough to do our first boil. We need at least a full tank (850 gallons) before we can fire up our evaporator for that first "priming" boil. Got busy! Forgot to write on Tuesday. Nothing til today...and Scott fired up with Jordan at noon with plans to prime the evaporator. Says Scott..."The first boil deals with raw sap in the entire system and it takes 4 to 5 hours before we make our first syrup. For the rest of the season, every boil starts with sap that's been concentrated to almost syrup. Therefore, within 45 to 60 minutes of lighting our fire, if we're doing a good job, we're in production of maple syrup." So today we didn't have enough sap to make syrup...but "it's starting to smell good!". Friday March 9 12:12 a.m. It's the "Sugar Moon" tonight! The full moon in March that often brings sap. Sure enough, we got sap today and it will likely run all night with these mild temperatures. Wish I were down at the camp. Scott's still there, boiling with Jordan. The sap ran pretty well today. Steady. We had a tank by day's end so he fired up at around 4. Will he go all night? We'll see. It's not getting cold. Bring it on! Samara's sleeping fitfully...a nasty cold has swept through this house since she started school last month. I'm finishing up endless emails. We had a great day children today: Ecole Bois Joli and then the Tim Horton's Camp. Tomorrow it's more schools and sugar on snow and sap and fresh syrup. Happy Spring! Scott and Jordan fired up at around 4 again and boiled til the tanks were empty. Made some yummy syrup! Now we need warm temperatures again...and it's looking like maybe Monday. Unless this sunny day coming Sunday brings a surprise of sap! By the end of the day Sunday we only had about 5 inches of sap. Today? It is a perfect sap day. Cold last night and nice and sunny today. Scott is madly running around in town doing errands and getting restaurant and maple supplies because Samara is still not well...and then he'll come back and likely fire up. Samara and I will walk down at around 2 to check the sap and switch tanks if necessary. The way this week looks, we could be very busy with sap! Today we're closed to the public...like every Monday. It's a badly needed day off for hard-working staff and a day "off" for family. Tomorrow, Tuesday and right through Friday we are open to the public 1 pm to 4 pm. Restaurant serves til 3:30. Mornings closed to public because of private large group bookings. Happy March Break! Scott just fired up the evaporator. It's going to be a late night! Had just under a full tank an hour ago and we don't have a lot of storage space so have to boil it down tonight. Jordan is on his way over, fortunately. It's supposed to be minus 11 tonight so the sap should drop off after the sun goes down. Happy boiling! Went for a beautiful spring walk today...how lovely this time of year is. Scott is bottling some syrup now that he made this afternoon. Had just enough sap to fire up. DELICIOUS syrup. Busy day at the restaurant with little Acadienne children this morning and then March Break crowds in the afternoon. Tomorrow the weather sounds pretty rough - check our toll free line 1-866-81-maple before setting out to see if you can actually get here! Happy Birthday sweet sugarmaker Scott! Today is foggy, misty and there is ice on the trees. But the sun is supposed to come out and we'll see a high of plus 6 later. That means we'll get some sap. At the moment we only have a few inches in the tank and that came yesterday. Those couple of days of weather earlier this week did't give us anything much of anything but a bit more snow...which is fine! I heard that producers in Cumberland got a pretty good run out of it. So we might boil today, maybe later if we get enough. And hopefully tomorrow. BIG crowds at the restaurant and farm these days. Check out our home page HERE for tips on visiting us during this busy time! Happy Spring! VERY busy day...and the sap ran a little early on and then ended up filling a tank by the end of day. We expect that we'll have two full tanks by morning and will be firing up fairly early - mid morning perhaps. Special day tomorrow with Bob Williams, previous owner with whom we apprenticed, coming to fire the evaporator. Come before 10 am or after 3 to avoid the crowds! A great day here. Scott fired up at 10 am and Bob joined us and did the day with him. Glenda, Bob's long-time partner, came out and bottled. Just like old times! Linda Little did awesome tours all day and Jordan was on the sugar on snow. We had well over 400 people - crazy busy but fun. Made LOTS of syrup and expect to boil again tomorrow morning as it was running when Scott came home at 8:30 tonight. Thanks to our amazing hard-working staff who handled it all with grace and smiles. And thanks to all our customers who came all the way out to Earltown to celebrate spring. Boiling today. There was 17 inches of sap in one tank this morning so Scott and Jordan are cleaning that up. It looks like we may get more this week...and looks good for the weekend too. Beautiful sunny day up here! Another great boil today! They made LOTS of syrup and have already made what we made during the whole 2010 season...which was a dismal year. Scott said that at one point it was 30 degrees in the camp today - a long hot and productive boil. Sounds like we might get more tomorrow. Just now getting a chance to write! Sorry...but we have been very busy with school groups and sap this week. All good! We boiled yesterday and today, just a little bit - and cleaned up the sap that came each day. This weekend the temps look good..tentatively. We made dark syrup today and are assuming that it will lighten up? In the meantime, remember that we are open special hours over Easter Weekend - Friday, Saturday, Sunday and Monday. Beautiful sunny day here! No sap all week...and is the season over? We sure made some dark syrup last boil...tasty but definitely end-of-season flavour. We are watching the trees and the buds...and all the signs are that the season has ended. Scott will "pull the line" when he's sure. We'll keep you posted. In the meantime, come out and enjoy all day brunch, sugar on snow, free sugar camp tours, awesome hiking and delicious maple products and syrup from throughout the season! We had almost 200 children from Middle Musquodoboit Education Centre over the past two days. What a pleasure! Today it's the spouses of Firefighter Curlers from across Canada. Scott tested the sap. It's no good for syrup. It's all done. Sad but true. A great day today at the Earltown Maple Festival! What great music, food, volunteers...and syrup! We have LOTS of syrup and delicious products. Plan on coming out on Easter Weekend cause we are OPEN Friday, Saturday, Sunday and Monday, offering sugar camp tours, sugar on snow, maple brunch and maple products. 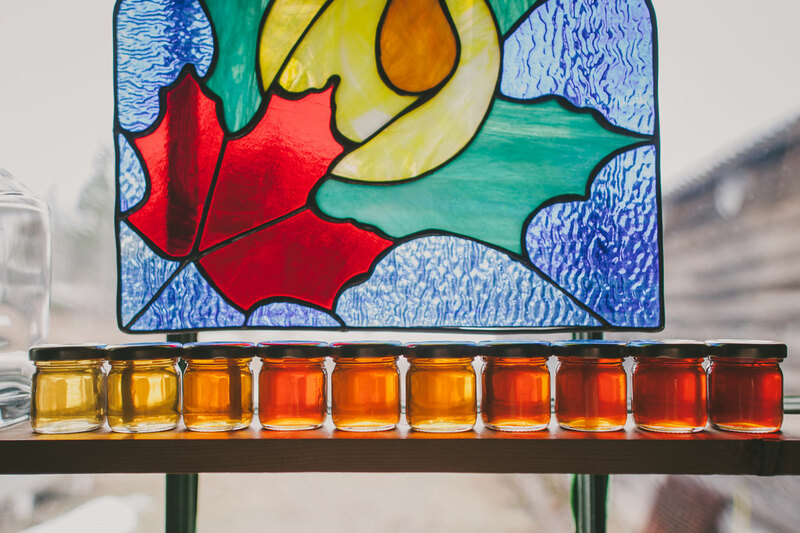 Late night thoughts on our maple sugaring season: it was short and sweet; it ended all too quickly on our side of the mountain; it was another lower than average production year on our farm. And we are grateful. We have had record-breaking crowds here at the farm all through March and expect Easter Weekend and beyond to be very busy. Our staff has been phenomenal. We have 5 - yes 5!- kinds of syrup on the shelf right now...providing our guests with quite an education for the palate. And we have the best Chefs' Night Season ever planned for 2012. A Women's Hiking Day on May 19. The Scottish Gathering in Earltown in August. And a LOT of International Groups coming in April. Oh...and Saltscapes Expo coming up at the end of the month. Tomorrow we all take a much-needed day off to celebrate a special event - our little Sugar Baby's 7th Birthday on April 5. Happy Birthday sweet Samara! Thank-you for reading and sharing our season! Happy Spring to all.